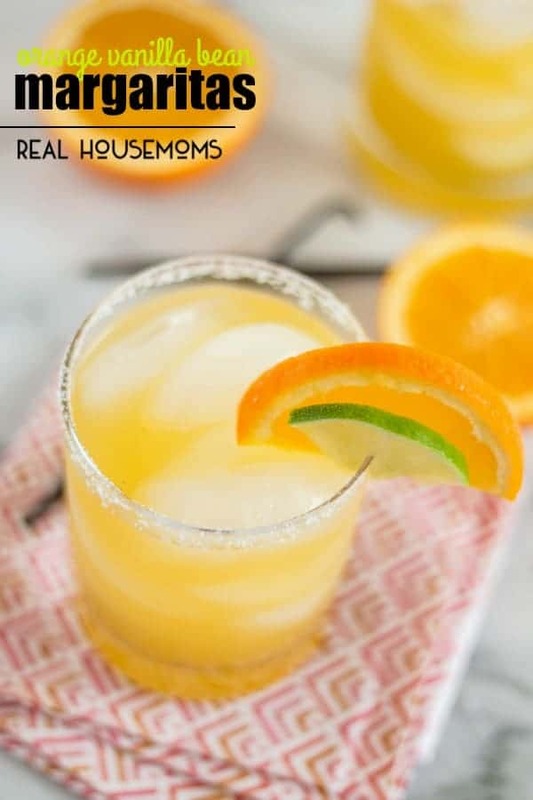 Our refreshing ORANGE VANILLA BEAN MARGARITAS are the perfect mix of sweet and tart flavors! Margaritas are one of my all-time favorite cocktails. I think what I love most is that there are so many flavor possibilities! I was chatting with some friends the other day and we were discussing some of our favorites (prickly pear, Chambord margs and my favorite – these Skinny Margaritas topped that list). Living in Arizona, we have our fair share of restaurants with creative margarita menus so it’s always fun to try new ones when we are out to eat. There is one thing I learned in my early twenties – that you never order a margarita from a bar. Chances are you are going to get something overly sweet/sour and pretty much undrinkable. The exception to this rule is of course if you are at a bar where a bartender has time to make you a proper margarita or if they have all fresh ingredients (aka not bottled margarita mix…eww). The key is to make margaritas at home (we use anytime we have Mexican food as an excuse). During the winter here we have an abundance of fresh citrus. Friends with orange trees are giving them away by the bagful – and I can never say no to juicy ripe AZ oranges! I normally make a big batch of my homemade Grand Marnier (even better than the store bought for a fraction of the price!) but I like to use the juice for fun things too. Which leads me to these fabulous margaritas. 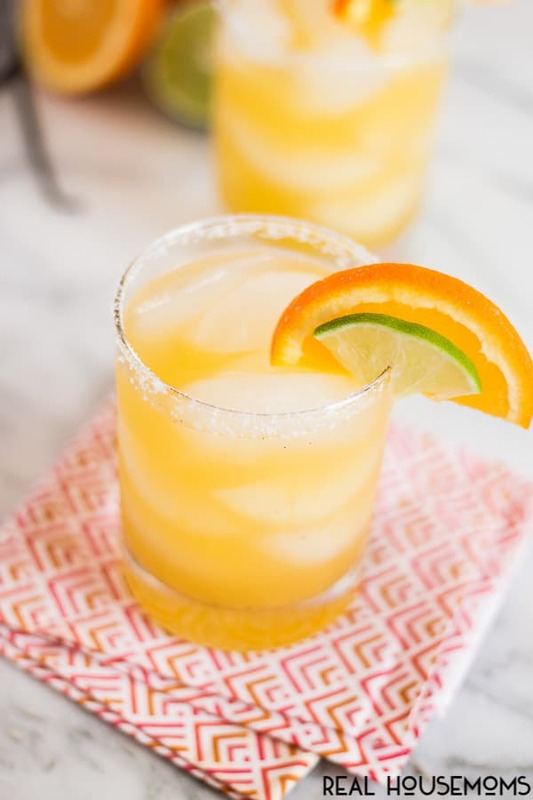 I highly recommend using both fresh orange juice and fresh lime juice for these margaritas (stuff from a bottle just isn’t the same) but in a pinch you could use a bottled fresh squeezed orange juice (like Simply Orange) and just squeeze your limes. And one last tip – I urge you to use actual Grand Marnier- or Cointreau if you have to compromise – please do not use triple sec, it will diminish the excellent orange flavor. If you have never made your own simple syrup before, it’s super easy. And making it into vanilla bean simple syrup? Just as easy! I like to make a full batch of this simple syrup so I can use the rest to put into tea and coffee (or more margaritas) – trust me, you’ll use it up! 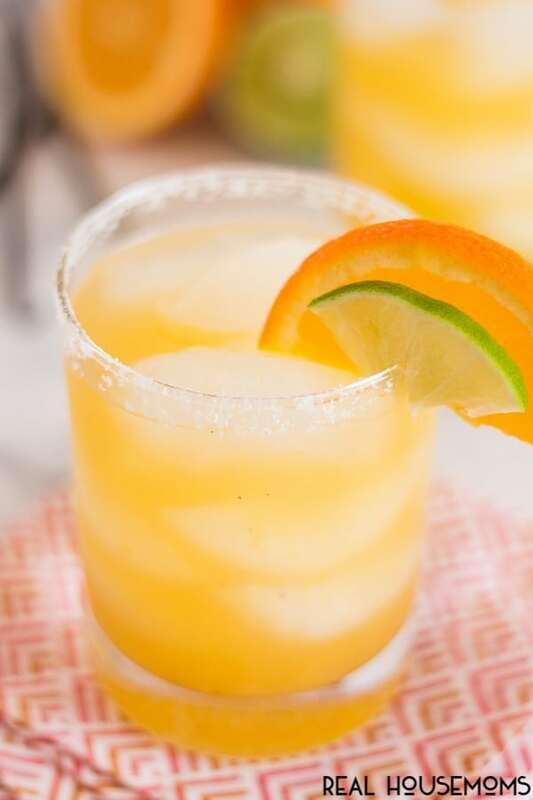 These margaritas are smooth and really easy to drink (I blame the vanilla-orange combo) so be ready to kick up your feet and pour yourself a few! 4 ounces Tequila gold or silver – your choice! In a medium size saucepan combine sugar and water. Scrape the seeds from the vanilla bean and add seeds and pods to the sugar water. Bring mixture to a boil, stirring occasionally. Remove from heat and cover for 20-25 minutes to steep vanilla bean and cool. Remove vanilla bean pods from saucepan and discard. Store in an airtight container in the refrigerator for up to 1 month. To prepare glasses (optional): Moisten the outside rim of each glass with a lime wedge. Dab the rim into salt, while turning to coat outer edge. Fill each glass with ice. Fill a cocktail shaker with ice. 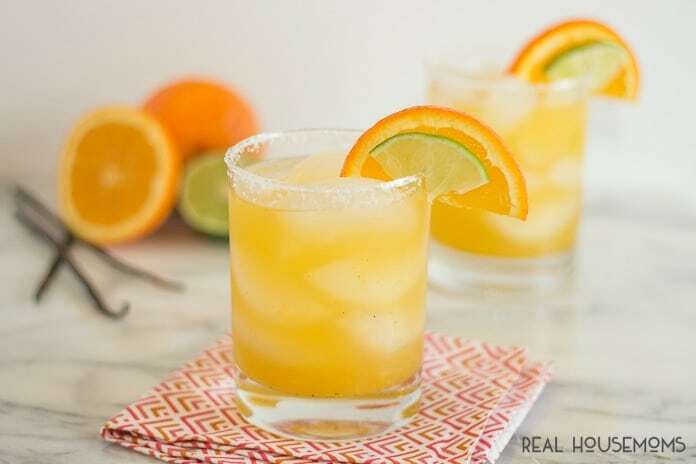 Pour in tequila, orange juice, lime juice, Grand Marnier, vanilla extract, and vanilla bean simple syrup. Shake to combine and chill. Strain into prepared glasses and garnish with an orange and lime wedge.